This recently released Cassini image shows yet another spectacular view from the space probe as it orbits Saturn. In this picture Saturn's moons Dione and Rhea pass in the night. As seen from Cassini Dione crosses the face of Rhea. 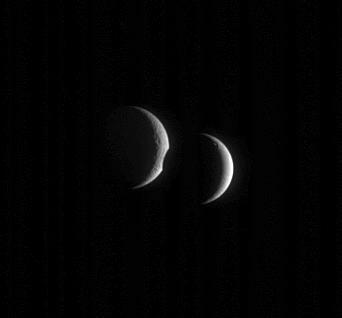 Dione is the smaller of the two satellites with a diameter of around 700 miles it is about 2/3 the size of Rhea. The image was taken from a distance of about 1.7 million miles from Dione (about 1.9 million miles from Rhea).